I hate to say it, but Heroes has lost its hold on me. The first season was very imaginative and engaging, with its XMen-like premise. Despite its anti-climatic finale, I still watched when season two rolled out. 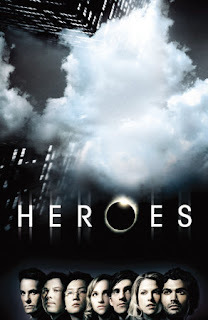 Struggling through its disjointed story-telling, too many new heroes and not enough of the heroes we cared about, I'm sure the writers' strike didn't help the show any. Now season three is just unwatchable. I find myself watching the clock or once, even dozing off. The plot lines are even more convoluted. The heroes are villains, and the villains are heroes. Even murderous Sylar, the über-villain is getting a make-over. And he's Peter and Nathan's long-lost bro? C'mon...it's just creepy. Arthur Petrelli's the Big Bad, Peter's just always sneering and angry, Ali Larter is on her third personality, Hiro is getting irritating, Mohinder is turning into some insect and Claire I just stopped caring about. I keep watching in hopes that the writing will get better, but I'm not holding my breath. Who will Save the Show?